I always look for your post. It does not bother me that I am not much into garden but enjoy how you do it. Love from India. Your garden looks spectacular, as always. I love, love, love that muhly grass – it certainly is showy! Your privacy fence looks great, too. My little basement (doesn’t go under the whole house on this side.) generates over 2 gallons daily, but alas, I have next to nothing to water, but whatever’s potted on the porches. So I fill the watering can whenever needed. Good luck with your surgery – you’ll be getting a much-needed break, like it or not, eh? Did you ever see that cardinal again to see how he/she is doing? Thanks Jeanne. Chipping away at endless projects, and making progress. Painted lower patio and all patio furniture last week and wrapped up the roof caulking/painting. Still some touch up to do at carport and patio. Why not just spill the basement water onto the turf if you have no plants to water. Surely you have a tree that would welcome the extra moisture…even the old ones. Babe is not around unless it shed the hanging thing. There are other young cardinals feeding here, yet Babe left one day I was out of food. At least the week Babe fed here, it became strong and perky. Perhaps, since the weather is so warm here, Babe is finding other natural yummies in the area. I love all that muhly grass! 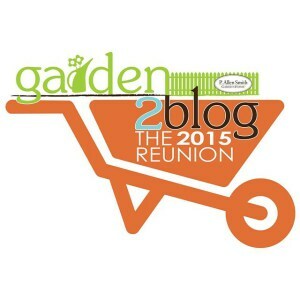 I hope to meet you at the 2017 Capital Region Garden Bloggers Fling! One of our sponsors is giving away gorgeous peonies. :o) There’s more info on my blog and on our Garden Blogger Fling Facebook page. I love your muhly grass, this year I’m going to investigate the possibility of growing in here in Canberra. Do you use your dehumidifier to provide water for the garden? Sounds wonderful. Good luck with the gorgeous peonies! Muhly is tough. I never fertilize it or water it and have divided it many times, as the clumps enlarge…Muhlenbergia Capillaris (I think I have it spelled correctly, or close!) All it requires is a sheer to the ground after the color fades to blonde and the stems begin to break…I cinch a rope around the base, pull tight, then cut off with a wood saw or chain saw. Most of my peonies are 60+ years and are from my home place on Long Island. They were sent to me 15 years ago when I moved here. There are a total of 24 plants here now…three varieties. Would love to add a few tree peonies, yet the cost is prohibitive. In the last three years I have discovered a new passion for bulbs…daffs, lilies, tulips. Converted raised beds to bulb beds provide an April cash crop at the farmer’s market…and peonies are harvested in May…600 stems last season. Big job, but someone has to do it! Cheers and a happy growing season to you. PS If you go to my search bar on my blog page and type in Muhly, you will see more photos of my grasses. D.
As always, I so love the muhly. It really is such a delight to see it backlit by sun…stops me in my tracks every time. Best of luck with your knee repair…sounds like your place is prepped and ready for the gardener to take some well earned time off. Michaele, although I do not care for pink in my landscape, I made an exception with Muhly. When the setting sun and breezes dance through the stand, I stop what I am doing and gaze at the loveliness. Also frost and dew make a splendid show too. Diane, Is it possible the crape myrtle leaves got darker when it bloomed? It appears that way to me in this photo. I hope your knee has fully recovered & you had a prosperous year at the city market. Also how did Babe fare this summer ? He appeared to be struggling in your post featuring him. Hi Joe, I think that the Black Diamond became glossier as the summer went by, especially when I kept it well hydrated. I do hope it survives its first winter here, as I so love the leaves and flowers, which continue even today. As for the snow, I indeed hope none arrives, as my repaired knee will not approve of hand shoveling. Did you get rid of that spammer? Hi Diane, Good luck with your surgery & the rehab to follow. I’ve had good luck with over wintering borderline hardy crape myrtles by heavy mulching. When small i double wrapped them with burlap but they died back to the ground the 1st. year. Last winter I did’nt bother to wrap them & they did fine. Perhaps they aclimated. Loving that Crape Myrtle. It’s a die-back shrub for me, but if it keeps on giving that gorgeous, dark foliage, I’m fine with that. Love your privacy fence, too! And that Black Diamond Crape blooms all year too! Still has a cluster as I write…hope it likes Virginia winters, as I welcome this specimen…the tag said it would grow in Michigan too. Are you sure it would die back in your zone? That privacy is worth its weight in gold Tim. 11′ tall at one end and 8’at the other, providing necessary screening from a derelict property behind me. Now to say goodbye to those needy cypress trees which encroach from behind. Lessons learned. Thanks for your comments. I don’t visit GPOD anymore, as I found it to be loaded with viruses. I’m betting you have good luck with the black diamond Crape Myrtle. I bought mine, rather small, last year and then did something I almost never do: gave it extra winter protection. We had an unbelievably mild winter for Ohio and it still froze to about an inch tall. It’s the same size now as it was last year, and I’m betting it will bounce back a little bigger and thicker each year, as if I were intentionally coppicing it.